I thought I had the audio settings all worked out but people said my mic was too low. So I turned it all the way up and now it sounds tinny. Plus I had to turn the music way up which was uncomfortable for me. I need to work this out for the next time. HOT Guild was a lot more inactive than I thought. 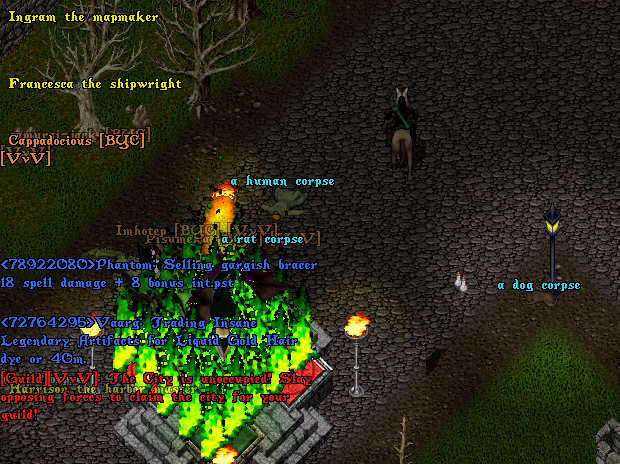 The two people who I played with last night (Rafman and Richworf) also have not really played UO in years. A third didn’t have macros setup. Three members were online but not on guilded characters. All of us had poor equipment. This all has to be worked on. The giveaways didn’t work out as planned. The processing server was slow or down. I think in the future it has to be done by trivia questions. I didn’t think to announce the 100 million gold chase in game chat, that would have gotten some more interest. I think there is a lot of fun that can be had doing this. I have more ideas for the next one. All in all I think things went as well as couple be expected. My first day back playing UO: couldn’t remember my macros, using a different keyboard, loud music playing in my ears, trying to keep talking the entire time, trying to lead a team of out of practice players, and fighting stealthing dismount ninjas who outnumbered us two to one. I am going to do another stream this Friday, October 17 starting at 7PM EST. It is just going to be me going through a bunch of stuff in my houses and reminiscing about where it came from. I hope some rare collectors will be on to chat with. The following weekend on Sunday October 26 it will be the big breakout VvV event of Atlantic. By then we should have several HOT ready to go do battle. There will be giveaways again and the 100 million gold chase sequel. See you next time. Have a Nice day.